Link a Drip email list to your online store and subscribe customers to your email list during checkout. Create multiple flat rate shipping. You can now configure a Drip email list in your online store settings to allow your customers to subscribe to an email list during checkout. You need to first contact us to configure your Drip integration then you can set your Drip campaign identifier to subscribe your customers to during checkout. You can find your Drip campaign identifier inside your Drip account. Customers have the option to opt out during the checkout process if they choose. 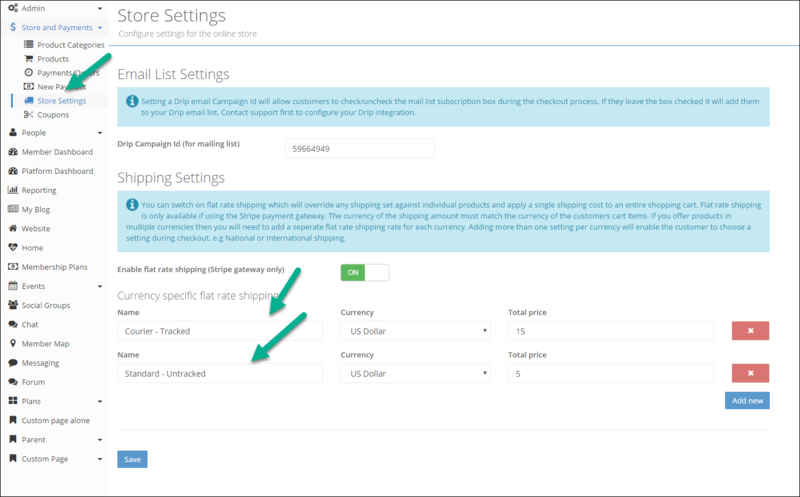 You can now configure more than one flat rate shipping option per currency for your online store. This allows you to configure multiple shipping costs depending on your customers needs or location. e.g you could set both "national" or "international" shipping at a different price or you could set "tracked" vs "non-tracked" shipping. If you have switched flat rate shipping on and you configure more than one setting per currency then the customer will be able to select the flat rate shipping option during the checkout process.